Last summer I had the opportunity to drive the all-new 2014 Corvette Stingray on the backs roads of Monterey. It was a thrilling experience and you can read about my impressions of this amazing sports car here. The Corvette team more than met the challenge of creating the seventh-generation Corvette that would also be worthy of reviving the Stingray name. The new design is striking and the performance surpasses the already high standards achieved by the Corvette team. With the removable hard top, any new Corvette owner can enjoy the experience of driving this great vehicle while enjoying the fresh air and beauty of the surrounding scenery. 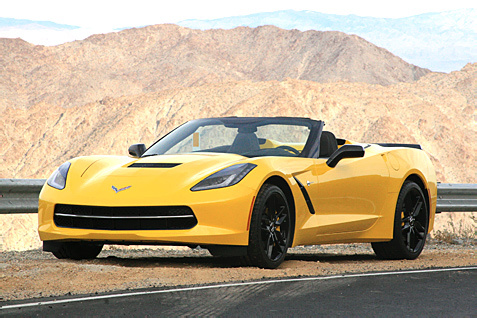 But the Corvette convertible makes that experience even more convenient of course, and I recently got to experience the thrill of driving this beast of a sports car with the top down in the mountains surrounding Palm Springs when we were invited to test drive the new convertible. All convertibles are fun on a nice day, but the experience in the new Corvette Stingray is quite different when you consider the 455 horsepower engine with 460 lb.-ft. of torque. The Z51-equipped models are able to accelerate from 0-60 in 3.8 seconds, run the quarter-mile in 12 seconds at 119 mph, achieve 1.03g in cornering grip and stop from 60 mph in 107 feet. Factor in the incredible handling and the various drive modes, having the top down with this vehicle gives you quite an experience as you navigate the roads. I had a beautiful day in the area near Palm Springs and it was a challenge to keep my eyes on the road with the stunning scenery surrounding me. The Corvette Stingray convertible features an all-new, fully electronic top that can be lowered remotely using the key fob. With the all-new folding mechanism the top can be lowered in just 21 seconds. For even more convenience, the top can also be opened or closed as you’re driving at speeds of up to 30 mph. I tested it at low speeds and it worked great. The Corvette is also pretty quiet when the top is up. The designers focused on luxury and comfort with this new model, and the thick fabric top, along with sound-absorbing padding and a glass rear window, contributes to a quiet cabin and premium appearance. As you can see from the photos, this beautiful vehicle looks fantastic as a convertible with the top down. The profile view looks great along with views from all other angles. I also liked the Stingray’s signature “waterfall” design which brings the car’s exterior color into the interior in the valley between the seats. The coupe and convertible share identical chassis tuning and performance technologies along with nearly-identical curb weights, as the only structural changes for the convertible model are limited to accommodations for the folding top and repositioned safety belt mounts. With the all-new aluminum frame structure, no structural reinforcements were needed in the convertible. You’ll sacrifice some cargo space in order the have the convenience of the convertible, and it costs $5,000 more than the coupe. As I said when I reviewed the coupe, the Corvette team hit a home run with this new Stingray, and now with the convertible buyers have another great option to choose from along with the Z51 performance package. And it doesn’t end there. The Corvette team just unveiled the new 2015 Corvette ZO6 for those enthusiasts who want to take their track experiences to an even higher level. But for most buyers, the base Corvette or the Z51 will offer a driving experience that will far exceed their expectations.